Flambeed Desserts are still an all time favorite in New Orleans - Here is the recipe for Banana's Foster from Brennan's Restaurant. Maybe make this a dessert station at your wedding! I might just try to make this tonight! In a large sauté pan over medium heat, combine the butter, brown sugar and cinnamon. Cook, stirring occasionally, until the butter melts and the sugar is dissolved, 4 to 5 minutes. Add the banana slices and cook, turning once, until just tender, 1 to 2 minutes per side. In a small cup, stir together the rum and vanilla. Turn off the burner, then add the rum mixture to the banana mixture. Using a long match or lighter, light the alcohol by placing the flame just inside the outer edge of the pan. Stand as far back from the pan as possible, keeping your face and hands away from the pan. The flame will be a faint blue but will be very hot. It should extinguish in 5 to 10 seconds. Holding the pan handle with an oven mitt, gently shake the pan from side to side to coat the bananas with the sauce. Scoop vanilla ice cream into individual bowls. 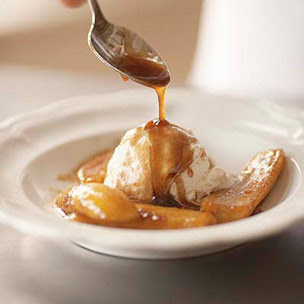 Spoon some of the bananas and sauce over the ice cream, dividing evenly. Serve immediately. Serves 4 to 6.